Opening tomorrow at the South Tyrol Museum of Archaeology in Bozen, northern Italy, is a special exhibition that marks the 20th anniversary of Ötzi the prehistoric Iceman’s discovery in the Alps on the Italian-Austrian border. 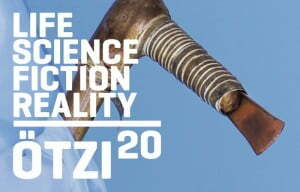 Ötzi20 – Life. Science. Fiction. Reality will run from 1 March 2011 through to 13 January 2013 and explores the last two decades of science, media and mysteries that surround this now most famous of archaeological mummies. Our academic and popular fascination with the Iceman centers largely on our desire to know what he actually looked like in the flesh. The highlight of the opening of this exciting exhibition will then almost certainly be the unveiling of a new reconstruction of Ötzi. Dutch artists, and twins, Adrie and Alfons Kennis have used 3D images of his skull as well as X-ray and CT images of his body to give us some idea of what this 45 year old man, who lived about 5,300 years ago in the Copper Age. On 19 September 1991, the mummified corpse we now call Ötzi was found by two German tourists, Helmut and Erika Simon, who were walking in the Ötztal Alps in Italy. Initially, the body was thought to be a modern corpse, and was rather crudely (by archaeological standards at least) but respectfully removed from the ice and taken to a mortuary in Innsbruck. Once the true age of the body was established, archaeological excavations of the area were undertaken. At 45 years old, it is thought that Ötzi was about 1.65 metres (5 feet 5 inches), approximately 50 kilograms (110 pounds) in weight. This is one of the oldest mummies in the World. Various artefacts which have been crucial in adding much to what we now know of about the Iceman, including leather and hide remnants, grasses, string, pieces of skin, muscle fibres, hair and a fingernail, the bearskin cap, as well as a part of the broken longbow. 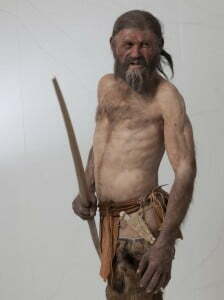 Because Ötzi was buried in the snow soon after he died, his body, his clothing (including a cap, loincloth, leggings, coat and shoes) and his equipment (including an axe, dagger, bow, arrows, backpack) are remarkably preserved and provide an unprecedented opportunity to recreate what this man looked like and how he was dressed and equipped. Not only have archaeologists been give a wonderful glimpse into the life from someone living during the Copper Age, but Ötzi has become a Worldwide sensation, with all sorts of rumours, speculations and fantasies making their way into the popular media. Some people claim to be the reincarnation of this prehistoric man. There is even said to be an Ötzi curse because some people involved in the initial recovery and the subsequent scientific investigations of the Iceman have died from accidents or disease. It is all these aspects of our fascination with the Iceman that makes up this special exhibition. This anniversary exhibition occupies the entire exhibition space of the South Tyrol Museum of Archaeology. Each of the four floors focuses on one of the exhibitions themes: life, science, fiction and reality. A great deal of planning and design has gone into this exhibition, and with various interactive elements, as well as films, interviews and hands-on exhibits all come together to guarantee an educational experience that is both exciting and entertaining. The Ötzi20 exhibition is one of the first of its kind to explore all aspects of an archaeological ‘object’ – going above and beyond the purely scientific aspect of the body. The exhibition explores the role the media has played in developing popular understandings about Ötzi, including the images and sometimes bizarre phenomena this discovery has given rise to. And as there is on going research, the results of these new investigations will be continuously added to the displays. The Trentino Alto-Adige region of Northern Italy is often overlooked by Italy’s du jour travel sites but getting off the tourist radar and traveling through the Sud-Tirol was one of the best times I’ve had in Italy (and I’ve been to Italy more than 12 times). Seeing the Iceman in the South Tirol Museum of Archeology, driving through the Dolomites, eating wurstels and stinco in Bolzano/Bozen, staying in the chalets of Cavalese reminds you that the food of Italy is more than pasta and the archeology more than the ruins of Rome.